SWEDISH RADIO "MITT I MUSIKEN"
Mats Wendt is registered at STIM and IFPI. 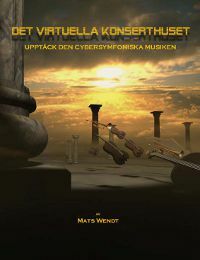 All music, art and graphic is the intellectual property of Mats Wendt. Eddan at Historiska museet in Stockholm 2010. 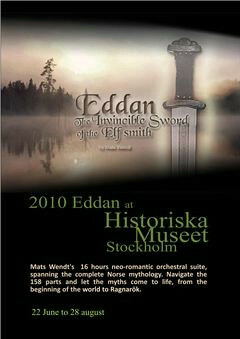 Eddan is displayed during summer at the museum of History in Stockholm in a interactive installation. 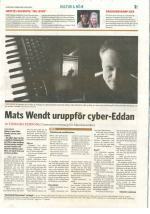 Mats Wendt was interviewed in Swedens main Radio news show in P1 StudioEtt. 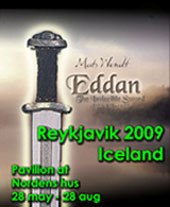 Eddan premiere opens in Reykjavik/Iceland 2009. The 28 May to the 28 Aug, Eddan is displayed in an interactive installation residing in a special pavilion beside Nordens Hus in Reykjavik. It will be possible to view the work and experience the myths through emotions carried by the music. Eddan returning to the source. 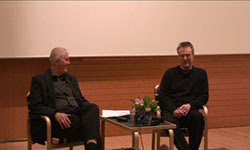 Director of Iceland music museum Bjarki Sveinbjörnsson talks with Mats Wendt in a video recording at the premiere opening of Eddan in Reykjavik. 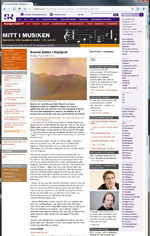 Among other papers, Music and Vision the worlds first daily classical global news site had the event in the news. The US Today picked up the premiere in the "News from the Web "section. Swedish radio p1 and p2 sweden's classical music news radio show. 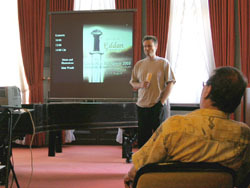 Quick facts: Eddan was composed between 1999 and 2008 with preparation from 1993.The first attempt was in 1982 with Voluspa (the norns prophecy), a contemporary piece that failed to tap into the mythological world. Eddan uses themes to represent different beings, situations and reminiscence. 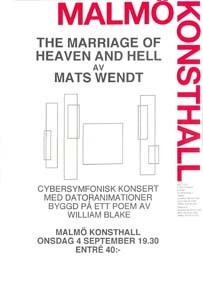 The concert hall, was a conceptual meta-work made by MW, that contained all MW's music from 1993. It was shown for two years in the museum of science in Malmö in a amphitheatre containing the interactive installation. (See below). The finished parts from Eddan was also shown in this interactive installation. The work on Eddan began after seven years of preparations. 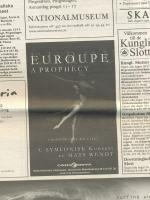 1999 Mats Wendt's first performance of Euroupe a prophecy in a unique concert at Imax theatre Cosmonova in Stockholm. Museum of natural history in Stockholm hosted the premier of EaP at the “in house” IMAX theatre Cosmonova as a special event. To the premier MW had made an CG ballet that was displayed on the big screen to accompany the music. This work is based on the poem by the English poet and universal genius William Blake. 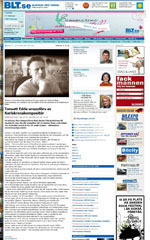 This ad for the event was published in Metro, aftonbladet, DN, Svenska dagbladet and Expressen. 5 hours from the work preformed for a week during Wagner festspiele, shown parallel with the Der ring des Nibelung. Mats Wendt talks about the work in the salon of Wahnfried, that was Richard Wagner's former home. Frans Liszt's piano in the background. Three psychological portraits first preformed at European art festival. Rome / Italy.